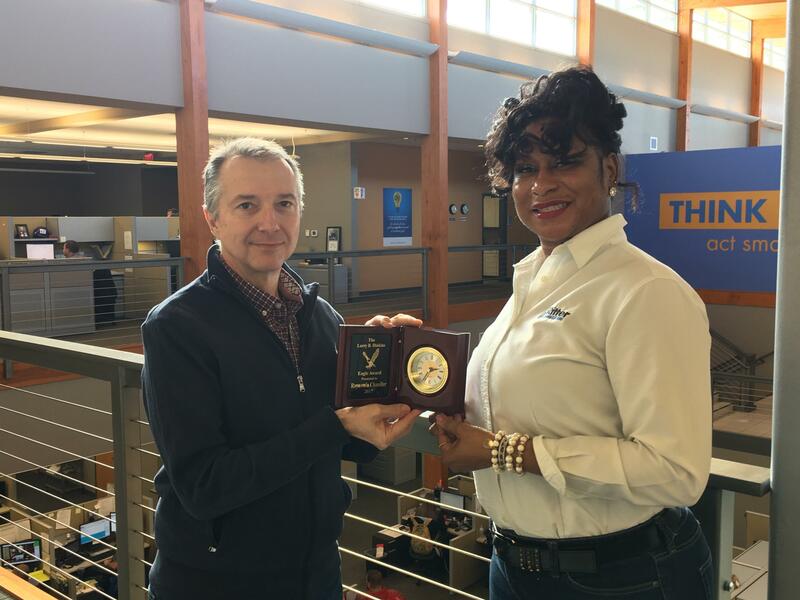 JONESBORO – Ritter Communications recently announced that Raynessia Chandler, a Customer Care Supervisor, is the recipient of the 2017 Larry B. Dinkins Eagle Award. Chandler, a native of Marked Tree who resides in Jonesboro, joined Ritter Communications in 2001 as an accounting assistant. She has worked in customer care since 2006. The Eagle Award is given each year to an employee who goes above and beyond expectations, possesses a helpful attitude and honors Ritter Communications values. The Eagle Award selection committee honors an employee who has continual growth in his/her career, has a heart for Ritter Communications customers, is an example to other employees and has the respect of his peers. Nominees possess leadership and team spirit, and the recipient of this award is well-liked by employees. The award originated in 2004 to honor much-admired Ritter colleague, Larry B. Dinkins, following his unexpected passing. Larry left an indelible impression on the Ritter Communications team thanks to his uncompromising personality, feverish commitment to customer service and the exceptionally high performance standards he demanded, both from himself and the team around him. An avid bird watcher, Dinkins had a special affinity for the bald eagle, even traveling to watch and care for eagles. Ritter Communications management considered it a fitting tribute to name the award after these noble creatures Dinkins so admired, hence the Eagle Award was born.